Chrichton's World: Review Triple Frontier (2019): Ideal film to watch on a Sunday! 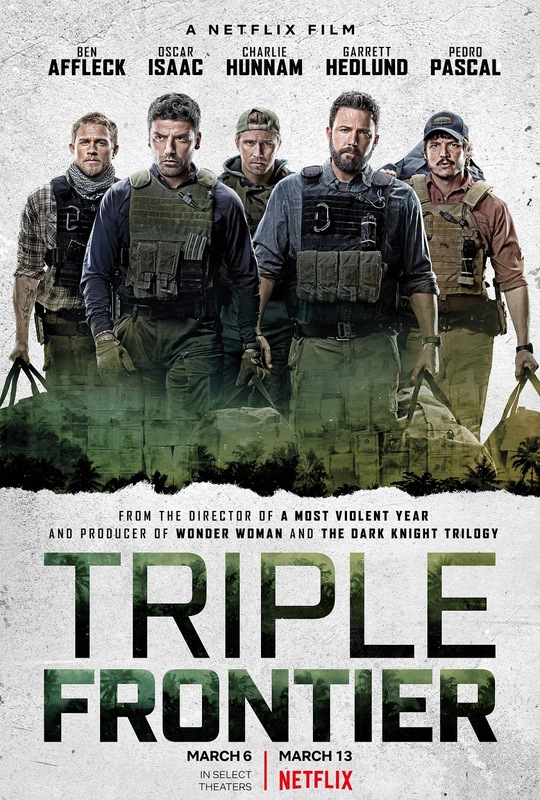 Review Triple Frontier (2019): Ideal film to watch on a Sunday! Triple Frontier has the promise of it being an edgy and political film. However ends as a very generic title. How can this be? I mean you have Ben Affleck, Charlie Hunnam, Oscar Isaac, Garett Hedlund and Pedro Pascal as your main characters. Each of them have that something that could have made this film infinitely more interesting. To be fair you can hardly blame them. They did what they could with the script and poor direction. I kind of understand what J.C. Chandor was going for. He is trying to make people see how pointless the war on drugs or war in general can be. But more importantly he wants to critique what happens after these wars with the soldiers once they have retired. For the most part life after seems dark and bleak. They have developed skills they can't use in other professions or just get plain bored. Some others don't feel appreciated as much as they should for their heroism. I guess if you weren't aware of this fact then yes the message could be compelling. Perhaps there is merit to this message. Then again, this whole war on drugs could be stopped with one action. The legalization of drugs. I am sure that the other wars started also are done out of economic and political reasons that have very little to do with maintaining peace and freedom. In this day and age we should know better. But where the film really fails is to heighten the tension and the paranoia. The script had a real potential to make this a film about people at their worst. And it looked like it was going there until someone pulled the plug on that idea. Perhaps they thought people wouldn't be able to handle that kind of pessimism. Instead we get a few skirmishes and insults. Very little else.The main characters have never seen this amount of money. Surely this would be plenty of motivation to become selfish and greedy. Unfortunately this angle falls flat just as almost every action scene after the heist. Actually during the heist the film presents all kinds of problems. Mainly where it is asked of you to ignore logic. And how convenient everything is. Then there is the fact that we hardly get to know what the main characters are about. I mean because of the stellar performances we get an idea of what they are supposed to represent. However I really would have appreciated it had we gotten more on them. So with barely any tension or other thrills going on you would expect a film like this to offer at least some good action. The action is serviceable and enjoyable but that is about it. This is yet another Netflix film where it becomes painfully obvious that you need a director who can do a lot with very little. In the Eighties and Nineties you had very capable and brilliant directors who could get the most of the low budgets they received. Especially when it's this type of film concerned. The film was moving like a train and then comes to a halt and barely recovers from that. That being said it is exactly the type of film that is ideal to watch on a Sunday like today. It's entertaining while it lasts and it's not one where you actually have to put a lot of investment and effort in.